Raise your hand if you’ve been caught up in the confusion of differentiating artificial intelligence (AI) & machine learning (ML). Although the two terms are usually used as synonyms, they do not quite refer to the same things. 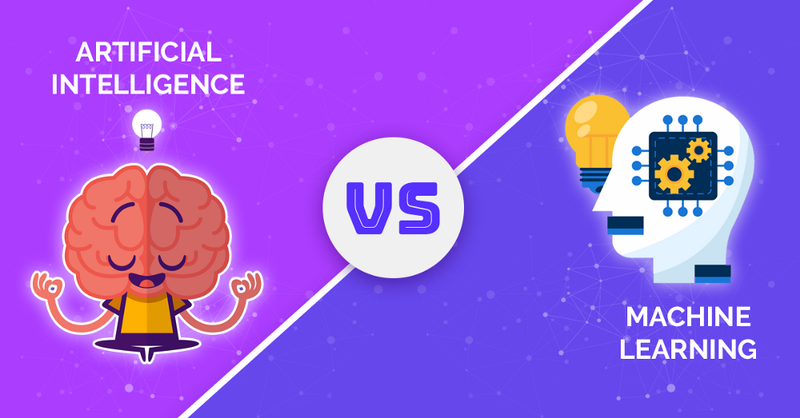 Let’s dig deep into the differences between Artificial Intelligence & Machine Learning. Loosely translated, AI involves machines that think and behave the way humans do. The basic idea of AI is to mimic a human brain inside a machine. It can be considered that the goal of AI is to create systems that can function intelligently and independently. As humans speak and communicate through language AI functions the same way with the help of speech recognition, and as humans can write and read text in a language, AI tends to replicate this phenomenon using the field of NLP. AI is a system with the potential to resolve issues that are sometimes done by humans with their natural intelligence. AI deals with much more generic complications of automating a system. This automation can be done by the means of any field as mentioned above which also includes, image processing, neural networks, machine learning or other. All in all, AI deals with making machines, systems and other devices smart by giving them the ability to think and do tasks as we humans do. This is the bottom line of AI. Machine learning works on the basis of computer programs that can access historical data and use it to automatically learn and improve from experience. The intention of Machine Learning is to allow fellow machines to learn by themselves using the provided data and make accurate predictions. When looked at it closely, Machine Learning is a subset of artificial intelligence; it is merely a method for releasing Artificial Intelligence. It is a methodology that allows training algorithms to be able to learn and make decisions on their own. Training in machine learning gives out a lot of data to the algorithm and allows the machine to learn more about the processed information. Machine Learning (ML), on a regular basis deals with making your machine learn from the external surroundings. These external surroundings could be in the form of sensors, electronic components, external data storage devices and many other. What Machine Learning does is, based on the user input or a query by the user, the system checks whether it is present in the knowledge base or not. If the input or query is present, the system will return the result to the user associated with that query or input, but if it is not stored initially, the machine will learn the user input and will improve its knowledge base, so as to provide better value to the end user for better experience. Machine Learning and Artificial Intelligence are completely different. Artificial Intelligence is more generic, whereas Machine Learning is more specific as it deals with classifications, clustering, prediction and other operations. Artificial Intelligence deals with images, multimedia, neural networks, expert systems and other fields which work based on the type of data the user has. 1. Reasoning: The ability/power to unravel issues logical deduction. e.g. financial asset management, legal assessment, financial application processing, games, weather prediction. 2. Knowledge: The ability to present knowledge about the world. e.g. Equity market trading, purchase prediction, fraud prevention, medical diagnosis, content recommendation. 3. Planning: The ability to set and achieve goals. e.g. inventory management, demand forecasting, predictive maintenance, navigation, scheduling logistics. 4. Communication: The ability to understand spoken and written language. e.g. real-time translation of spoken and written languages, real-time transcription, intelligent assistants, voice control, AI-based bots for augmenting customer experience. 5. Perception: The ability to infer things concerning the world via sounds, images, and other sensory inputs. e.g. medical diagnosis, autonomous vehicles, surveillance. As a tech company providing machine learning (ML) services, we often get to explain to our clients how they can integrate Machine Learning into their businesses. Having answered numerous questions in this regard, we at Suretek Infosoft came up with the idea of developing a ML adoption strategy, based on our knowledge and experience. Here are five practical uses of this technology for enterprises. 1. Understanding Legal Language: Machine learning can help companies break-down complex legal documents. A Legal Bot is a machine learning model that can determine whether something is missing from a contract and detects elements that do not belong in a particular contract; for instance, a royalty fee section in a non-disclosure agreement. 2. Data Security: Malware and malicious files are a growing downside for several industries. Machine learning models can discover patterns in how data is accessed and determine irregularities that could result in loop-holes in security. 3. Product Recommendations: If you are in the online retail environment, then you know that your customers like having personalized recommendations delivered to them. Machine learning algorithms if employed at a consistent rate improves the shopping experience of users and can offer you a way to sell more services/products. 4. Predictive analysis: Businesses constantly need insights on how well their products/services will do in the market given so and so conditions. With competitors raising the bar each day, businesses often want to find out what the effect of xyz decision will have on their sales. Machine Learning can adapt the historical data and provide market analysis that will boost sales. 5. Image Classification: Machine Learning has a wide range of business applications including Image Recognition that allows for identifying what an image depicts based on 2D designs, social media photo tagging, informing medical diagnoses, and more. Artificial Intelligence and Machine Learning are by-products of both science and myth. Machine learning is an umbrella term for different algorithms and technologies that can be used to automate learning from new information and is to be considered a sub set of Artificial Intelligence. As Artificial Intelligence goes deeper, it is not just a discipline that mimics human brain but incorporates a series of intelligent transformations, in order to build intelligent machines. Artificial Intelligence has evolved into a general term that could mean several things, including machine learning.